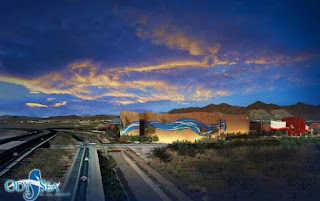 A new 75,000-square-foot restaurant and retail center is under construction on the Salt River Pima Maricopa Indian Community next to the new OdySea Aquarium and Butterfly Wonderland attractions off the Loop 101 freeway. The Shops at OdySea in the Desert sit near the Loop 101 and Via de Ventura Drive on Salt River land that borders Scottsdale. Ari Spiro's Orion Investment Real Estate is marketing the retail and restaurant center adjacent to the Loop 101 aquarium.